I was recently gifted with an iPad mini and it was interesting to see how big an improvement it was over the somewhat sclerotic first generation iPad we own. That machine, while very cool when we first got it, quickly aged and now spends most of its time crashing the Safari app or playing solitaire. Right out of the box, everything is smoother on this new machine. Mail, calendars photos and music synched perfectly with the cloud and I was off and running in less than an hour. Even better, while tablets still mostly feel like entertainment devices, the mini is capable of helping with work. When I’m working off campus with my MacBook Air, the mini often serves as a second screen. It can work successfully as a stand alone and mimic almost every program I use on either of my Macs. I even came across a shell app for Tel-Net access to a legacy IBM mainframe I work with on almost a daily basis (Yes, those still exist and are useful). So it wasn’t too long before I downloaded the iBook app and decided to give digital reading a second try. My conclusion is this: I’m fortunate to be part of a “straddle” generation. We’re the people who adapted to personal computing, made it part of our professional and personal lives. But we remember a time when computers were large, distant, and mostly used for accounting and launching NASA rockets. And I want to say this: I laugh at digital apologists who frequently say how much “greener” eBooks are? Seriously? How do they think those shiny slabs of metal, plastic and lord knows what else are made? What do you think powers your Wi-Fi? Have you seen pictures of the air in Beijing and Shanghai? While there may be some green washing on both sides of the “debate” let’s point out that at least paper is created out of a renewable resource that is recyclable. Moreover, in my little shallow backwater of the publishing business (Newsstand Distribution), almost every single thing that enters a wholesalers’ warehouse is recyclable. I did try reading on the iPad 1 early on and was displeased with how awkward and heavy the tablet felt after a while. So I was expecting a better experience with the mini. Meh. We added what was supposed to be a “lightweight” cover to the tablet but in all honesty, at some point it feels just like a large book. Granted, it’s not like a Stephen King “Under The Dome” hardback, but still. So how was reading with it? The screen image is nice. The mini is the right size for reading. I liked the nighttime reading feature. That is certainly an improvement over a book light. Downloading books, presuming the books were in the iBook store was very quick. On the flip side, it was a little odd finding that I could download books that are now in the public domain for free. I suppose I should be grateful for having free access to Shakespeare’s “Macbeth”, but it felt a little like stealing. The ability to switch the screen to white on black for nighttime reading is one of the big pluses for me. In either daytime or nighttime mode, the screen is easily readable and switching out of iBook into other apps is, of course, easy. I didn’t find the iBook store any harder to navigate than I find almost any other digital store. Which is to say that I’m not that easily impressed. In other words, I’m impressed with the technology. But still not the layout or ease of use. It’s not that any of this is difficult to use. I’m far from a technophobe. I just don’t like having to think about what I’m doing when I am reading. 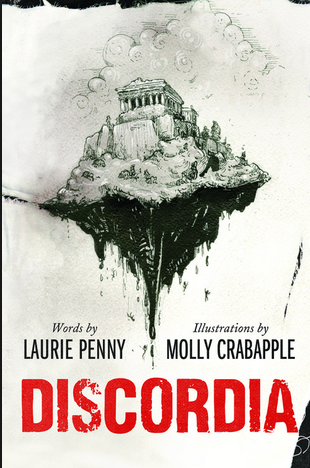 The first book I downloaded and read through was “Discordia” by British journalist Laurie Penny and American artist Molly Crabapple. The short book is not available in print and was intentionally designed as an e-book. In its digital form, it was remarkably cheap. I’m a fan of Molly Crabapple’s art work. It’s sort of cross between neo-Victorian and Steampunk. The book is a journal/artistic rendering of the time Crabapple and Penny spent in Greece during the financial and social meltdown in the summer of 2012. Laurie Penny’s prose is a modern take on Hunter S. Thompson and gives a lot of weight and empathy to the plight of the upcoming generation of the underclass. Her writing is direct, forceful and thought-provoking. In my first read through the book, I was stuck by how either I couldn’t, or couldn’t figure out how to zoom in on the images. I Googled my problem and found many unhelpful suggestions. Once again, tech was in the way of reading. The latest version of iOS seems to have resolved this. Or I may have stumbled across the solution without realizing it. Another issue I ran into was one of bookmarks and controls. I found getting the controls for bookmarks and scrolling touchy at times. If I tap the screen accidentally, the page will turn on me. Are there comparable issues with an old-fashioned print book? Yes, but whether reading for pleasure, learning or business, I don’t want to be thinking about technology. And then there’s the public library. If I want a book at the library, I go there and get it. If I’m lazy, I sign in remotely, reserve the book, then go get it when it gets placed on the shelf for me to pick up. If I want a digital book from the library, well that’s an entirely different story. Opponents of the ACA (aka Obamacare) have been having fun laughing at the web site. If they want to see a real horror, check out digital public libraries. Go see for yourself. I did download a more contemporary novel and found layout and ease of navigation pretty fair. In other words, there’s not a lot to complain about and anything I did complain about would sound like so much nitpicking. But I also downloaded what you could call a “legacy” book. 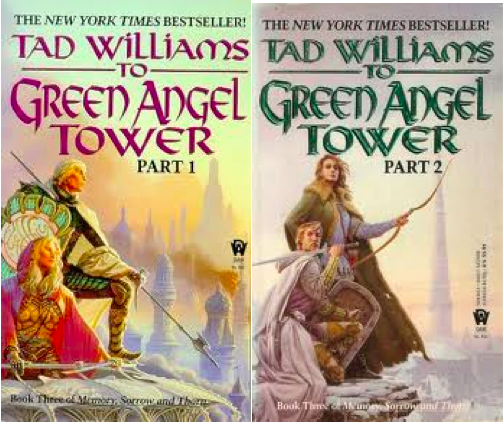 Something that had been in print for some time: American author Tad William’s “Memory, Sorrow and Thorn” series. This is a set of fantasy novels and if you’re a fan of the genre, you know that this means maps, glossaries and lots of turning back and forth to pick up complex and convoluted threads. What was interesting here was that the final book in the series had originally been published in two volumes. At the time, the publisher explained that they split the book in two because of the size (It’s very long) and they did not want to sacrifice publishing quality. In the digital world, that’s not an issue. So why are they sold as two books digitally? That’s a rhetorical question, by the way. Perhaps negotiating tablets and digital reading will become as second nature to younger generations as flipping a page and scanning an index is to our “straddle” generation. But given the tendency of hardware and software developers to fiddle with their designs, I wonder. What do I mean? Well, which version of Office is in your office? What do you think of the latest one you have? How long did it take for you to get “used” to it? Why do you have to get used to it? If I was filling out one of the endless customer surveys that are pushed at me after my latest web or bricks and mortar purchase, I would click on the number five: I neither “Like nor dislike” the experience. It’s OK. It’s nothing great. At times it is pleasant. At other times, I’m frustrated and wondering why I’m spending time with this. When reading becomes all about the tech and not the word, you’ve lost me. When the tech fails to enhance the word or image you’ve missed a wonderful opportunity. A contemporary novel, or even a “legacy” one is fine digitally. I would have loved to spent hours looking “Discordia” in print. My conclusion is this: The recently reported plateauing of digital book and magazine sales is might be the pause we see while the early adopters wait for the rest of the populace to catch up. We will see usage grow and new technologies change and adapt what we’re doing. None of this is going away paper lovers. But I hope (hope being the key word), that the tech will not overwhelm the importance and pleasure of the written word. Things Placed In Front of The Magazine Rack: Part 1 of …. There is an excellent interview with New Single Copy partner John Harrington in Media Life today and I strongly urge you to go and read it. In the interview, Harrington cites the economy as a key factor in the continuing decline in newsstand sales that everyone and their uncle likes to write about. He also points out that aggressive subscription marketing, digital initiatives and a weak wholesaling environment contribute to the softness in sales. In other words, as all of us who work in it know, it’s not just one thing. During a side trip through a desktop folder this morning, I realized that I have collected a fair amount of evidence that suggests another reason for the decline in single copy sales. It isn’t too many titles in one category, heavily discounted subs, the shift to digital, or the digital side putting some sort of voodoo on the print side over at corporate. 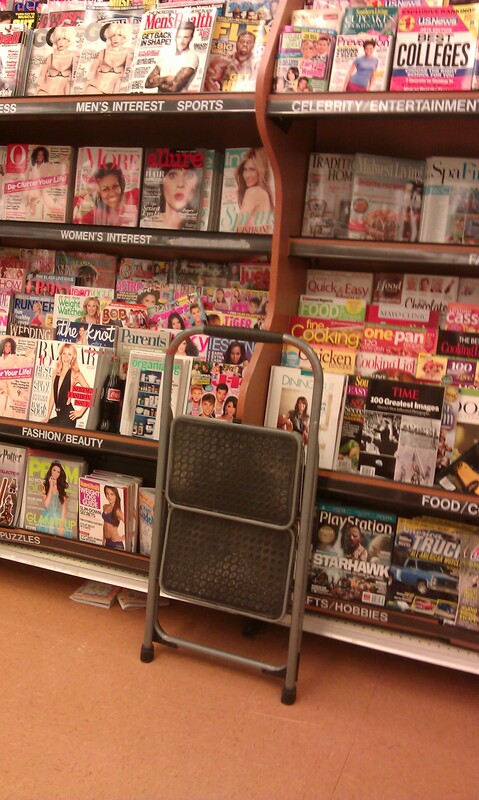 It’s too much sh*t getting put in front of the magazine racks. Yes, tongue is firmly planted in the cheek as I write these lines. 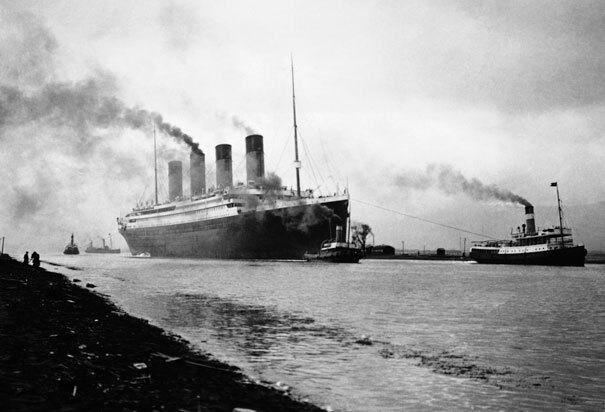 This topic does get covered regularly in this blog and seeing as how I have named this writing effort after a famously unsinkable ocean liner that ran into something and then sank, well…. “Things Placed In Front of The Magazine Rack” will now be a regular feature with regular updates. So pull out your cell phones, smart phones, iPads and Android tablets, snap away, and submit your best evidence of “Things Placed In Front of the Magazine Rack” to newsstandpromos at gmail.com. If I get enough entries, I’ll name a lucky winner at the end of the year. Now how can you resist that? There’s a drawer in the hutch in our family room that contains eight different cell phones we’ve retired over the years. The plan is to donate them. But first I have to get around to recharging and reseting them to “factory restore”. The phones range in age from a much loved Nokia VGA candy bar to a entirely unmissed, unloved and happily retired Windows Mobile phone. Down in our basement are two old Windows XP towers that kind of work. Before I haul them off for recycling this month I need to strip their hard drives out. Lying on the floor next to them are two newer HP laptops with fried hard drives. What is it with Vista and fried hard drives? Hiding in a corner somewhere, is my very first desktop: An Epson Equity IIe. 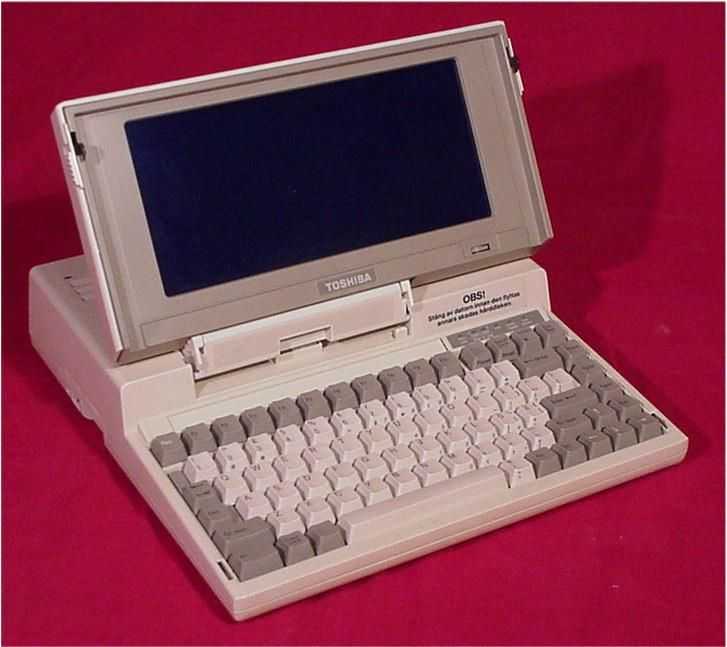 I wish I knew what happened to my first love: A Toshiba T1200 HD. The genie is out of the bottle and we’re well on our way into the age of digital reading. eBooks, digital magazines, the merger, melding and colliding of how we used to read and how we got that content is already here. No, I don’t see any evidence that all bricks and mortar stores are going away. Nor do I think that print magazines are obsolete and will wind up like buggy whips and mens spats. But the world is very different. Sort of. Is Flipboard or Editions the Reader’s Digest of the 21st Century? Does an eBook written by a “fan” and given away for free have the same value as the latest from Grisham or Picoult? These musings started when I began cleaning out some drawers in my office last week. I came across an old CD of a “Sonic the Hedgehog” game that came with a long ago recycled Win95 machine that came home when the daughters were very young. We spent hours playing and mastering that game and kept at it right though updates to Win98 and 2000. When WinXP came along, we could no longer play the game. Even deeper in the drawer were a stack of 20 floppies that compiled the original “All in One” program, “Open Access IV”, that managed my business on the old Toshiba back in 1988. And below that, a cracked and brittle floppy drive from another much loved game, “D-Generation” from Mindscape. Which got me thinking, of course. If all of these games and programs are long gone, what does this spell for digital books and magazines (and newspapers)? What happens when the iPad7 update is not backwards compatible? Will there be a time when app developers decide not to create something that works across platforms? What happens then if you’re on iOS, Android, Blackberry and whatever the latest incarnation of Windows Mobile and the app you need isn’t available? What if a major e-retailer like Amazon went belly up and their cloud disappeared? Interestingly enough, a few minutes on Google showed me what could be a slice of our future. 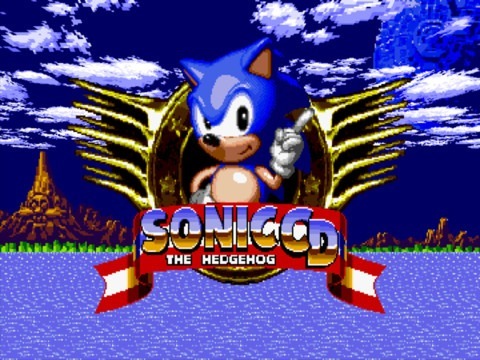 You can still play the Sonic CD game and download it onto your computer. Moreover, it’s available on gaming platforms. Not surprisingly, I can also download the D-Generation game and make it work on my Mac via a handy little program called Boxer. If you ever struggled with with DOS commands or early versions of Win 3.1 or 95, you’ll appreciate the boxing gloves icon that loads onto your dock. My original thought was that as we develop our technologies, a lot of things will be left behind. You could argue that there are many novels, newspapers, magazines and letters from earlier generations that have decayed into dust and are long gone. You’d be right. And much of what we’ve saved may never make it into digital libraries. On the other hand, it took decades, perhaps hundreds of years for all that print to decay or simply get lost. I learned in less than an hour that I can play some of the old games. Not everything gets lost or left behind. But there’s a lot of data from the ten years that I did manage to use on a DOS based “All in One” program (with a hell of a lot of ‘work arounds’) that, as far as I can tell, is lost, inaccessible, or at least, not easily accessed. How much more is gone, and gone for good? Will this be the future of reading? Of viewing? Of listening? The basic e-readers are pretty simple to use. But the goal of the manufacturer is to lock you into their store. How flexible is that? The newer tablets serve multiple purposes, which is cool. But it’s tech. It’s all about the tech. At some point, that tech becomes obsolete. And then what? Is it Reading? Is it Tech? Two months into my first job in the magazine distribution business, I went down to my mailbox one Friday morning after a long week on the road. Just like today, twenty nine years later, most of what was waiting for me was bills, flyers and some magazines I didn’t recall subscribing to. Newsflash kids: Nobody wrote letters back then either. Sitting under my mailbox was something I was very excited about: A huge box from my employer chock full sample magazines. Many of them were new launches. A big part of my job was to solicit orders from our wholesalers. One of those magazines was Computer Shopper. Back then the title wasn’t owned by Ziff Davis. It wasn’t slick, it wasn’t perfect bound, and it wasn’t more than the +800 pages it contained back when it was at it’s peak. In those early days, it was a yellow colored, easily tattered tabloid magazine. And in those early days of the 1980’s, personal computing was still something of a luxury and not something that was easily accomplished. An early copy of Computer Shopper a few years before my introduction to it. I didn’t. But apparently the look on my face convinced him that I didn’t get the joke either. Yeah, you do want to play poker with me. Ten years later while I was consulting for Ziff-Davis, that wholesaler would take 3,000 copies and sell well more than half of them. 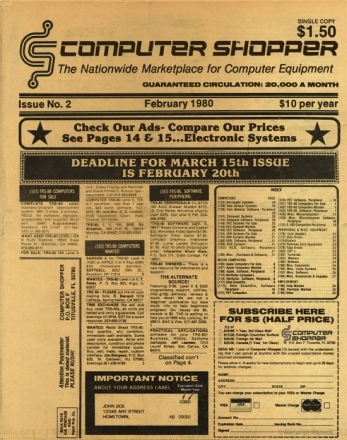 In the early 1990’s, ­Computer Shopper was selling well over 325,000 copies. The title enjoyed high efficiencies and had no problem getting into any of the major chain retailers in the country. The trend continued through the middle of the decade and sales did not really begin to slip until the middle of the latter part of the 1990’s. By the dawn of the last decade, the title was selling well under 150,000 copies. These days, the computer category in most stores is very thin and often dominated by one shots and specials. What made me think about all of this was my recent experiences with the iPad, and a test drive I did with some tablets while visiting with my local cell provider and the nearby Best Buy. It’s all about the tech. The iPad is great. I like it very much. The learning curve is not hugely steep, but it’s a curve and even if you’re a dedicated Mac user like I have become over the past year, it’s a different sort of computing experience. I found the Android powered tabs interesting. The experience was akin to the iPhone only maybe not so elegant. Like, but unlike their smartphone cousins. But the experience was all about the tech. I’ve bookmarked and subscribed to a slew of sites that review tablets. Many have interesting and steadily more professional looking video reviews of all of the new tablets that are coming out. The usual tech sites also give great reviews of these devices that are going to replace print magazines and books and newspapers. Some day. Maybe soon. And it’s all about the tech. Will we ever get past that? I‘m inclined to think not. It seems as though most of the articles I read about the publishing business tend to take a few core statistics and then make conclusions based on the opinions and prejudices of the person who wrote the article. If they’re published on-line, they are often nothing but opinion and treated like a news article. They make remarkably grand assumptions and, at least when it comes to talking about the print business, really off the wall assumptions about how we work, make money, what we’re concerned about, and how “green” we aren’t. Oh, and kids, here’s another newsflash for you: Paper is a renewable resource. You know, trees grow, scrub carbon dioxide out of the atmosphere. The coal fired power plant that charges the batteries on your iPad or Android tablet? Not so much. A truck delivered your tablet to your house. All those radishes you didn’t buy at Whole Foods? They get tossed. Just like last week’s People. Although last week’s People get’s shredded and recycled. I expect that print will become secondary to digital in terms of reading. But reading will become a secondary activity, if it isn’t already. The constant erosion of personal time and the increase in consumption of web related video will reduce reading and push it down the list of things people want to do. If new generations are not raised on print then they won’t read it or miss it unless they happen to discover it and take to it (It’s all about the marketing sometimes). And when it comes to reading, it should be all about the written word. Not the tech.